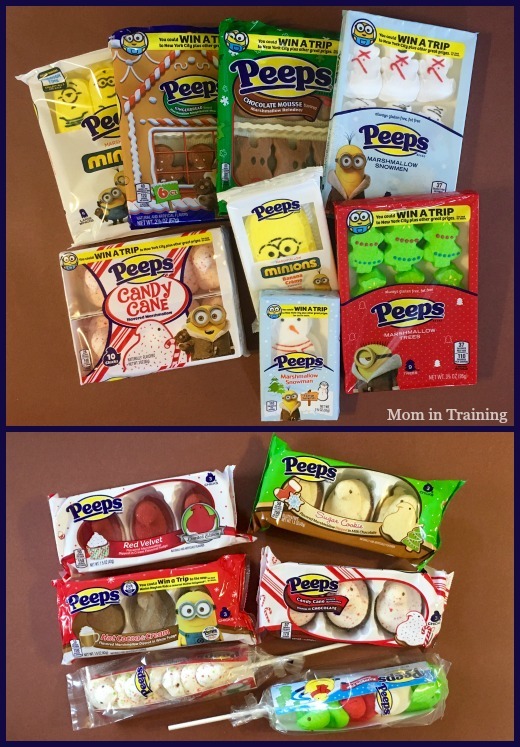 Stacy Tilton Reviews: Fill their stocking with PEEPS®! Fill their stocking with PEEPS®! I can remember back when you had to wait till Easter to get your yearly dose of PEEPS®. Now you can enjoy them at more than just Easter, and in fun shapes too! I love the holiday PEEPS® because they come in yummy flavors like Sugar Cookie and Hot Cocoa & Cream. I haven't decided exactly which of them is my favorite yet. Of course my kids love PEEPS® too and are excited to find them in their stocking. I try to give each of them PEEPS® on a stick and a three pack so they both have some to enjoy and tide them over till Easter comes. The iconic marshmallow candy brand, PEEPS®, is making the holiday season more festive with new flavors and shapes arriving just in time for the season of giving. Plus the fun loving Minions from the summer blockbuster movie “Minions” have taken over many of the PEEPS® Holiday collection for 2015! and a new look for the chick! I had no idea there are so many different kinds of peeps now! I will definitely look for them next week when I do my stockings shopping. Thanks for letting me know.